So the Chennai Metro Rail Limited, which runs the Central-Airport (25 km) and Airport-AG-DMS (15 km) services has today launched a limited last mile connectivity service using taxis and autos. From what media reports say, it is going to be a twice-an-hour service, with fixed share charges of Rs.10 and Rs.15 for the 3 km that it covers, along designated routes. A report in The Hindu says ” The shared car services will be available in Koyambedu, Alandur, Vadapalani and Anna Nagar East Metro Rail stations and share autos at AG-DMS, Guindy, Alandur, St. Thomas Mount, Ekkatuthangal and Ashok Nagar stations,” quoting officials. Sadly, this is not a viable solution for last mile connectivity for the simple reason that trains run every seven to ten minutes most times of the day, and it is impractical to expect passengers to wait for twenty minutes for the next share transport to be available. It is also another wasted opportunity to align the existing bus service with urban rail in Chennai, and to grow the network of small buses. All that the Tamil Nadu government had to do, as a partner in the Chennai Metro venture, was to provide a stop for regular MTC buses at each Metro station, so that passengers could switch modes effortlessly. It would have worked wonders for traffic and revenues for both networks. It is, of course, a tragic reality that this option has traditionally been neglected for the suburban train system as well, as this blog has pointed out in the past. Read about that here (this blog was reproduced by an independent website). By contrast, though, the taxi-auto transport mafia in Chennai Central was broken with the simple modification of allowing buses to enter the station, to drop off and pick-up passengers from within. The same holds good for the Western section of Egmore station, which now connects with the Chennai Metro as well. These developments on stunted last mile connectivity must come as a major source of worry and disappointment for the Japan International Cooperation Agency, which provided the funding linkage for the Chennai Metro project. If JICA had mandated public consultations with users on a regular basis, the management of the CMRL would have been compelled to listen to suggestions from the public, and make plans accordingly. So would the MTC, which has been cutting services citing shrinking patronage and mounting losses. 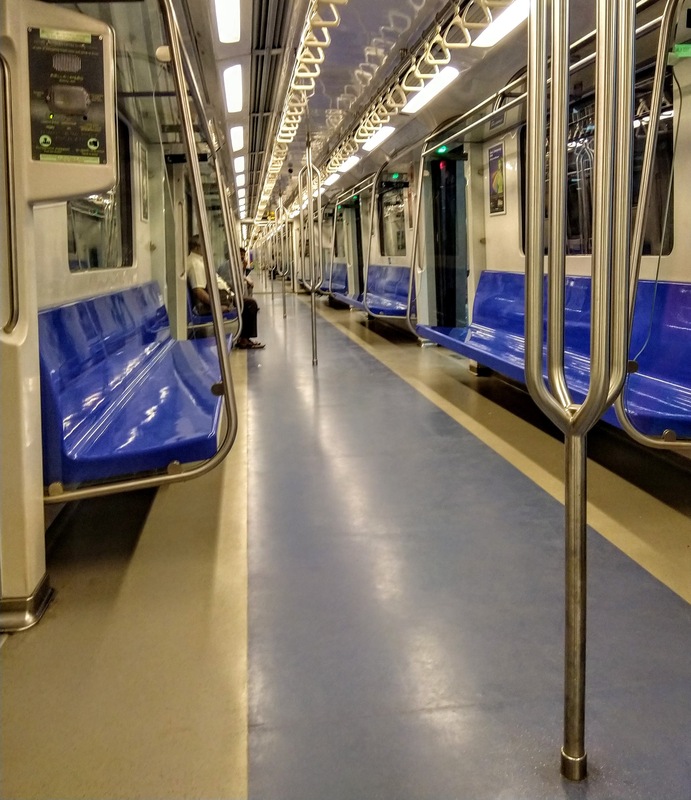 For the moment, though, commuters and Chennai Metro must be satisfied with just half-measures that just cannot provide a boost to the new train service. Realising the non-cooperative attitude of State governments such as the one in Tamil Nadu, the Central government proposed to amend the Motor Vehicles Act to make provision for last mile connectivity through new schemes that the States would have to compulsorily implement. This will be done through entirely new sections, 66A and 88A, added to the law. It has become necessary to do this, because of the amorphous growth of urban transport in Indian cities. Tourist taxi vehicles such as Share Autos are operating as virtual stage carriages (similar to buses, offering regular stops along a route to pick up and drop passengers on a fixed fare). These are illegal under the law, but are thriving in cities and unsurprisingly, are also welcomed by passengers in the absence of any affordable option. The proposed MV Act amendments are stuck in the Rajya Sabha, with little scope of being passed in the current session. As this editorial in The Hindu mentions, the States are opposed to the amendments because it compels them to adopt a new scheme initiated by the Centre. Yet, providing an easy-to-use and affordable last mile connectivity option in the form of 14 to 20 seater buses is a win-win for everyone. It can be rolled out overnight, if the regulatory structures are in place. It will help passengers move to stations – both Chennai Metro and Suburban Railway / MRTS – with minimum effort. It will decongest the inner city, making travel safer. The TN Government can put out a scheme, for private entrepreneurs to invest in, since the government is unable to expand MTC services. If it needs legislative compulsion to achieve this, because State governments refuse and want to protect vested interests, there is every reason to amend the Central law. The rights of the commuter should be of paramount importance. These rights are not antagonistic to the prospects of operators of last mile solutions like autorickshaws and share vans. In fact, they are supportive of it if there is a proper arrangement. No one can be allowed to create a bottleneck to exploit passengers, or to deny the expensive Chennai Metro the opportunity to serve thousands of commuters. Update: The Hindu today reports that there will be two share autos or two cabs to a station. They will operate once in 30 minutes as reported earlier. To put that in perspective, a train carries about 1,000 people. Clearly, no one is serious about feeder services.